• BEARS HABITAT IN THIS AREA. As a safety precaution, put your garbage into dumpsters as soon as possible. Keep food tightly closed in coolers and store those coolers out of site. Please do not keep food in your tent. Keep your barbecue and site as clean as possible. PLEASE ADHERE TO ALL NOTICES POSTED OR VERBALLY EXPRESSED BY CAMP STAFF. • Gray water and sewage should not be dumped on the ground, but only deposited at approved waste sites. • Use dumpsters for your campground garbage. Please, do not put garbage in fire rings as campers do cook on the fire rings. Also, do not put garbage in toilets as it is very difficult to remove. • Campground trees are very fragile. Please do not attach any ropes, nails, etc. to them not mark them with axes, hatchets or knives. 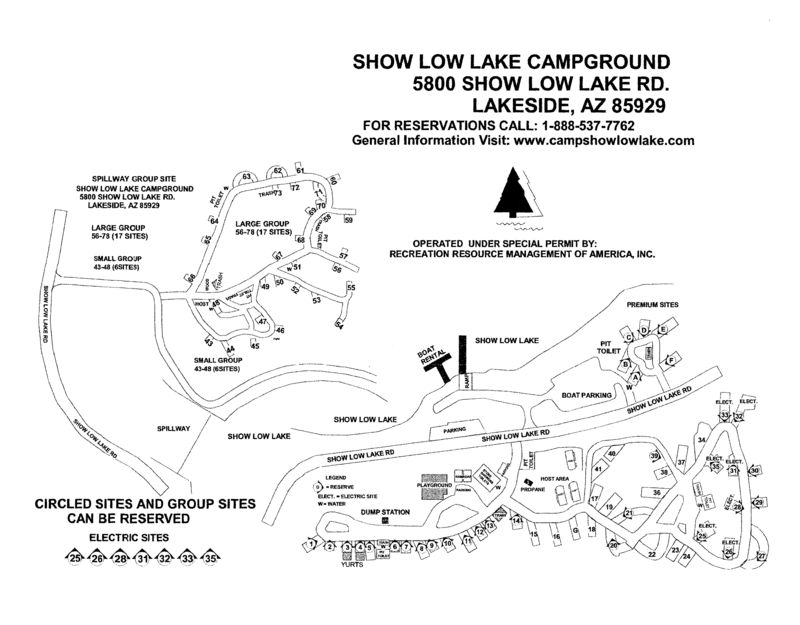 • Clothes lines are not permitted in the Show Low Lake Campground. • Quiet hours are from 10:00 PM to 6:00 am. Please do not use generators, loud radios, televisions, etc. between these hours. Construction generators are not permitted except for very brief periods. Talking quietly and avoiding other noisy activities is greatly appreciated by your neighbors. • To help prevent disturbing your neighbors and having to hunt a lost pet, please keep your pet on a leash at all times while you are in the campground. Maximum leash length is 6 feet. Please clean up after your pet. • Firearms use is prohibited in the Show Low Lake Campground. Use of BB guns, sling-shots or throwing objects which may cause injury are prohibited also. ALL Fireworks are illegal anywhere in the City of Show Low because of fire dangers. • For your safety and that of other campground users, please obey speed limit of 10 mph or as posted. All Off-Road vehicles are to comply with state and federal statutes for operation in the campground. • Additional Camp Units in a site are subject to an additional camp unit fee and will be paid at the campground directly. • Visitors staying more than 1 hour at any facility are subject to a picnic fee. Visiting hours end at 8:00 PM. • To RESERVE a campsite for future use, CALL 1-888-537-7762. A summary of these Rules and Regulations are posted on a bulletin board here on site at Show Low Lake Campground. Your cooperation will make your visit to the Show Low Lake Campground more enjoyable for you and your fellow campers.